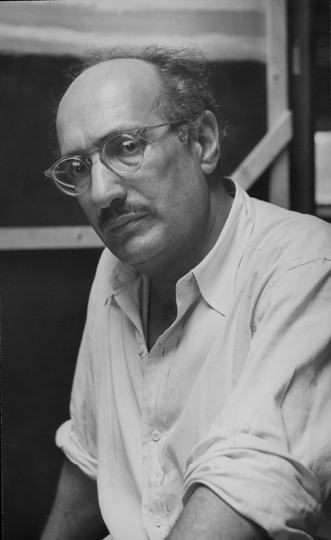 Considered to be one of the foremost American painters of the 20th Century, Rothko spent his early years in Portland, Oregon. Immigrating from Russia in 1913 at the age of ten, he attended Lincoln High School, then completed some of his early art education at the Museum Art School, which later became the Pacific Northwest College of Art. Although Portland Art Museum exhibited Rothko’s work in 1933-34, this is the first retrospective of his paintings that they have hosted. Works in the exhibit are on loan from the National Gallery of Art in Washington, D.C. and from Rothko family members, as well as a few pieces from other sources. The exhibit runs through May 27, 2012. The Portland Center Stage theater company is currently showing “Red,” a slice-of-life drama depicting Mark Rothko in the late 1950’s. This production with only two actors is set in Rothko’s New York City studio while he was working on a commission of large paintings for the Four Seasons Restaurant. The action centers on intense dialogue between Rothko, played by Daniel Benzali, and his assistant Ken, acted by Patrick Alparone. This Tony Award-winning play by John Logan runs through March 18, 2012. This is a rare and wonderful opportunity to learn about the life and work of Mark Rothko by viewing both his works of art and a theater presentation based on his philosophy about art. This example of symbiotic programming shows the possibilities for providing even greater cultural enrichment when arts organizations coordinate their offerings.